Fairchild-Republic A-10 Thunderbolt II "Warthog"
The A-10 Thunderbolt II is an American single-seat, twin-engine, straight-wing jet aircraft developed by Fairchild-Republic for the United States Air Force to provide close air support (CAS) of ground forces by attacking tanks, armored vehicles, and other ground targets, with a limited air interdiction capability. It is the first U.S. Air Force aircraft designed exclusively for close air support. The A-10's official name comes from the Republic P-47 Thunderbolt of World War II, a fighter that was particularly effective at close air support. However, the A-10 is more commonly known by its nickname "Warthog" or simply "Hog". As a secondary mission, it provides airborne forward air control, guiding other aircraft against ground targets. A-10s used primarily in this role are designated OA-10. Criticism that the U.S. Air Force did not take close air support seriously prompted a few service members to seek a specialized attack aircraft. In the Vietnam War, large numbers of ground-attack aircraft were shot down by small arms, surface-to-air missiles, and low-level anti-aircraft gunfire, prompting the development of an aircraft better able to survive such weapons. In addition, the UH-1 Huey and AH-1 Cobra helicopters of the day, which USAF commanders had said should handle close air support, were ill-suited for use against armor, carrying only anti-personnel machine guns and unguided rockets meant for soft targets. The F-4 Phantom II was pressed into close air support, but usually in emergencies, as its high cruising speed and fuel consumption hindered its ability to loiter. The lack of a gun on most F-4 variants, coupled with the relative ineffectiveness of the standard 20mm Vulcan round on gun-equipped F-4Es against hard targets, made strafing runs either impossible or ineffective. On 6 March 1967, the U.S. Air Force released a Request for Information to 21 defense companies. 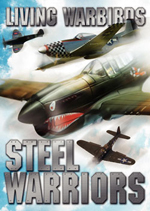 Their objective was to create a design study for a low-cost attack aircraft designated A-X, or "Attack Experimental". The officer in charge of the project was Colonel Avery Kay. In 1969, the Secretary of the Air Force asked Pierre Sprey to write the detailed specifications for the proposed A-X project. However, his initial involvement was kept secret due to Sprey's earlier controversial involvement in the F-X project. Sprey's discussions with A-1 Skyraider pilots operating in Vietnam and analysis of the effectiveness of current aircraft used in the role indicated the ideal aircraft should have long loiter time, low-speed maneuverability, massive cannon firepower, and extreme survivability; an aircraft that had the best elements of the Ilyushin Il-2, Henschel Hs 129 and A-1 Skyraider. The specifications also demanded that the aircraft cost less than $3 million. In May 1970, the USAF issued a modified, and much more detailed request for proposals, as the threat of Soviet armored forces and all-weather attack operations became more serious. Six companies submitted proposals to the USAF, with Northrop and Fairchild Republic selected to build prototypes: the YA-9A and YA-10A, respectively. The decision to make the 30 mm GAU-8 gun the main anti-tank weapon of the A-10 was influenced by Vietnam era A-1 pilots and by Hans-Ulrich Rudel and his book, "Stuka Pilot". In World War II, Rudel flew the Ju 87G Stuka for the Luftwaffe and destroyed many Soviet tanks using its two underwing 37 mm guns. His book was required reading for members on the A-X project. The JU-87G was an outmoded airframe with ersatz anti-tank weapons attached, yet still inflicted impressive casualties on Soviet tank forces. A-10s were initially an unwelcome addition to the arsenal in the eyes of Air Force brass. As the Air Force senior leadership became increasingly populated by general officers from the fighter community, the Air Force prized the high-flying, high-performance F-15 Eagle and F-16 Fighting Falcon air-superiority jets, and were determined to leave the dirty work of close air support primarily to Army helicopters (the development of the AGM-114 Hellfire anti-armor missile and AH-64 Apache attack helicopter having since provided the Army with a viable anti-tank aircraft). 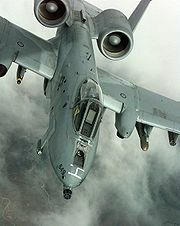 Attempts to transfer the A-10 to the Army and the Marines were at first prevented by the 1948 Key West Agreement, and then by the A-10's impressive combat record during the Gulf War in 1991. Shortly after the Gulf War, the Air Force gave up on the idea of replacing the A-10 with a close air support version of the F-16. The A-10 has received many upgrades over the years. Aircraft were upgraded with inertial navigation and a Pave Penny laser sensor (marked target seeker) pod that allowed the pilot to detect laser energy for PID (Positive Identification) of an illuminated target. The Pave Penny is a passive seeker and cannot self-designate a target for a Laser Guided Bomb (LGB). Later, the Low-Altitude Safety and Targeting Enhancement (LASTE) upgrade provided computerized weapon-aiming equipment, an autopilot, and ground-collision warning system. The A-10 is now compatible with night-vision goggles for low-light operation. In 1999, aircraft began to receive Global Positioning System navigation systems, and in 2005 began getting its LASTE system upgraded with the Integrated Flight & Fire Control Computers (IFFCC). The A-10 is scheduled to stay in service with the USAF until 2028. In 2005, the entire A-10 fleet also began receiving upgrades that would result in redesignation to the "C" model that will include improved fire control system (FCS), electronic countermeasures (ECM), and the ability to carry smart bombs. The A-10 will be part of a service life extension program (SLEP) with many receiving new wings. A contract to build 242 new A-10 wing sets was awarded to Boeing on 29 June 2007. Modifications to provide precision weapons capability are well underway. The Air Force Material Command's Ogden Air Logistics Center at Hill AFB, Utah completed work on its 100th A-10 precision engagement upgrade in January 2008. The C model upgrades are to be completed in 2011. The A-10 has superior maneuverability at low speeds and altitude, thanks to straight, wide wings with downturned "droop" wing tips. These also allow short takeoffs and landings, permitting operations from rugged, forward airfields near front lines. The aircraft can loiter for extended periods of time and operate under 1,000 feet (300 m) ceilings with 1.5-mile (2.4 km) visibility. It typically flies at a relatively slow speed of 300 knots (345 mph or 555 km/h), which makes it a much better candidate for the ground-attack role than fast fighter-bombers, which often have difficulty targeting small and slow-moving targets. Engine exhaust passes over the aircraft's horizontal stabilizer and between the twin tails, decreasing the A-10's infrared signature and lowering the likelihood that the aircraft can be targeted by heat-seeking missiles. The placement of the engines behind the wings partially shields them from anti-aircraft fire. Honeycomb panels of this type on the A-10 include the flap shrouds, the elevators, the rudders and other sections of the fins. The leading edge of the mainplane is honeycomb to provide strength with minimal weight compromise. The A-10 has integrally machined skin panels. Because the stringers are integral with the skin there are no join or seal problems. These panels, fabricated using computer controlled machining, reduce the time and hence the cost of manufacture. Combat experience has shown that this type of panel is more resistant. The skin is not load-bearing, so damaged skin sections can be easily replaced in the field, with makeshift materials if necessary. The ailerons are at the far ends of the wings to gain greater rolling moment as with most aircraft but there are two distinguishing features. First, the ailerons are larger than is typical, almost 50% of the chord, providing improved control even at slow speeds. The aileron is also split, making it a deceleron. The Thunderbolt II can be serviced and operated from bases with limited facilities near battle areas. An unusual feature is that many of the aircraft's parts are interchangeable between the left and right sides, including the engines, main landing gear, and vertical stabilizers. The sturdy landing gear, low-pressure tires and large, straight wings allow operation from short rough strips even with a heavy ordnance load, allowing the aircraft to operate from damaged airbases. The aircraft is designed to be refueled, rearmed and serviced with minimal equipment. Operating from a forward area is both useful for close air support and necessary due to the A-10's relatively low cruise and top speeds. Because of the close proximity of the front landing gear and the A-10's main cannon, the landing gear is offset to the aircraft's right and cannon slightly to the left (see schematic below). The offset front landing gear causes the A-10 to have dissimilar turning radii. Turning to the right on the ground takes less space than turning left. The A-10 is exceptionally hardy. Its strong airframe can survive direct hits from armor-piercing and high-explosive projectiles up to 23 mm. The aircraft has triple redundancy in its flight systems, with mechanical systems to back up double-redundant hydraulic systems. This permits pilots to fly and land when hydraulic power or part of a wing is lost. Flight without hydraulic power uses the manual reversion flight control system; this engages automatically for pitch and yaw control, and under pilot control (manual reversion switch) for roll control. In manual reversion mode, the A-10 is sufficiently controllable under favorable conditions to return to base and land, though control forces are much higher than normal. 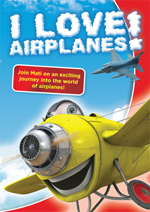 The aircraft is designed to fly with one engine, one tail, one elevator and half a wing torn off. Self-sealing fuel tanks are protected by fire-retardant foam. Additionally, the main landing gear is designed so that the wheels semi-protrude from their nacelles when the gear is retracted so as to make gear-up landings (belly landing) easier to control and less damaging to the aircraft's underside. They also are all hinged toward the rear of the aircraft, so if hydraulic power is lost the pilot can simply drop the gear and a combination of gravity and wind resistance will open and lock the gear in place. The cockpit and parts of the flight-control system are protected by 900 pounds (408 kg) of titanium armor, referred to as a titanium "bathtub". The tub has been tested to withstand strikes from 23 mm cannon fire and some strikes from 57 mm rounds. It is made up of titanium plates with thicknesses from ½ inch to 1½ inches determined by a study of likely trajectories and deflection angles. This protection comes at a cost, though; the armor itself weighs almost 6% of the entire aircraft’s empty weight. To protect the pilot from the fragmentation likely to be created from impact of a shell any interior surface of the tub that is directly exposed to the pilot is covered by a multi-layer Kevlar spall shield. The canopy consists of a bullet-proof diffusion-bonded stretched-acrylic to withstand small arms fire and is resistant to spalling. The front windscreen offers shielding resistant to 20 mm cannon fire. Recent proof of the durability of the A-10 was shown when then-Captain Kim Campbell, USAF, flying a ground support mission over Baghdad during the 2003 invasion of Iraq, suffered extensive flak damage to her A-10. Enemy fire damaged one of the A-10's engines and crippled its hydraulic system, forcing the back-up mechanical system to operate the aircraft's stabilizer and flight controls. Despite this, Campbell managed to fly it for an hour and landed it safely at the air base in manual reversion mode. There are several reasons for the unusual location of the A-10's General Electric TF34-GE-100 turbofan engines. First, the A-10 was expected to fly from forward air bases, often with semi-prepared substandard runways that presented a high risk of foreign object damage to the engines. The height of the engines lowers the chance that sand or stones will enter the inlet. This also allows engines to remain running, allowing for shorter servicing and rearming turn-around times by ground crew. Servicing and rearming are further helped by having wings closer to the ground than would be possible if the engines were wing-mounted. The position also reduces the IR signature, which starts low anyway due to the engines' 6:1 bypass ratio. Because of their high position, the engines are angled upward nine degrees to bring the combined thrust line closer to the aerodynamic center of the aircraft. This avoids trimming measures to counteract a nose-down pitching moment if the engines were parallel to the fuselage. The heavy engines require strong supports, so their pylons are connected to the airframe by four bolts. All four fuel tanks are near the center of the aircraft, reducing the likelihood that they will be hit or separated from the engines. The tanks are protected by several measures. The tanks are separate from the fuselage; thus, projectiles would need to penetrate the skin before reaching the tank. The refueling system is purged after use so that there is no fuel unprotected anywhere in the aircraft. All pipes self-seal if they are compromised. Most of the fuel system components are inside the tanks so that if a leak were to occur from the component the fuel would not be lost. If a tank does get damaged, check valves ensure that fuel does not flow into the compromised tank. Most importantly, reticulated polyurethane foam lines both the inner and outer sides of the fuel tanks, holding debris and restricting fuel spillage in the event of damage. The other source of possible combustion, the engines, are shielded from the fuel system and the rest of the airframe by firewalls and fire extinguishing equipment. 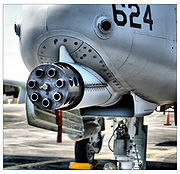 Although the A-10 can carry considerable disposable stores, its primary built-in weapon is the 30 mm GAU-8/A Avenger Gatling gun. One of the most powerful aircraft cannons ever flown, it fires large depleted uranium armor-piercing shells. In the original design, the pilot could switch between two rates of fire: 2,100 or 4,200 rounds per minute; this was changed to a fixed rate of 3,900 rounds per minute. The cannon takes about half a second to come up to speed, so 50 rounds are fired during the first second, 65 or 70 rounds per second thereafter. The gun is consistently accurate; it can place 80% of its shots within a 40-foot (12.4 m) circle from 4,000 feet (1,220 m) while in flight. The GAU-8 is optimized for a slant range of 4,000 feet (1,220 m) with the A-10 in a 30 degree dive. The fuselage of the aircraft is built around the gun. For example, the nose wheel is offset to the right so that the gun's firing barrel at the 9 o'clock position is aligned on the aircraft's centerline. The gun's drum holds 1,174 rounds of 30 mm ammunition. The early A-10s carried 1,350 rounds, but were replaced because the helix was susceptible to damage during loading. The 1,174-round drums were reinforced. The damage caused by a portion of those rounds firing prematurely due to impact of an explosive shell would be catastrophic. It is for this reason that a great deal of effort has been taken to protect the 5 ft (1.52 m) wide, 9 ft (2.74 m) long drum. There are many plates of differing thicknesses between the skin and the drum. These plates are called trigger plates because when an explosive shell hits a target it first penetrates its armor, then detonates. As the drum has many layers of thin armor, the shell's detonation is triggered before reaching the drum. A final layer of armor around the drum itself protects it from fragmentation damage. The gun is loaded by Syn-Tech's linked tube carrier GFU-7/E 30 mm ammunition loading assembly cart; a vehicle unique to the A-10 and GAU-8. Another commonly used weapon is the AGM-65 Maverick air-to-surface missile, with different variations for either electro-optical (TV-guided) or infra-red targeting. The Maverick allows targets to be engaged at much greater ranges than the cannon, a safer proposition in the face of modern anti-aircraft systems. During Desert Storm, in the absence of dedicated forward-looking infrared cameras, the Maverick's infra-red camera was used for night missions as a "poor man's FLIR". Other weapons include cluster bombs and Hydra rocket pods. Although the A-10 is equipped to deliver laser-guided bombs, their use is relatively uncommon; at the low altitudes and speeds of typical A-10 operations, standard unguided bombs provide adequate accuracy at far lower cost. In any event, the guided weapons would provide little benefit, as there would be nearly no time for the weapons to steer onto a target. A-10s usually fly with an ALQ-131 ECM pod under one wing and two AIM-9 Sidewinder air-to-air missiles under the other for self-defense. The A-10 Precision Engagement Modification Program is an estimated US$420 million program that will see 356 A-10s upgraded with a new flight computer, new glass cockpit displays and controls, two new 5.5 inch color displays with moving map function and an integrated digital stores management system. Other funded improvements to the A-10 fleet include a new data link, the ability to employ smart weapons such as the JDAM and Wind Corrected Munitions Dispensor, and the ability to carry an integrated targeting pod such as the Northrop Grumman LITENING targeting pod or the Lockheed Martin Sniper XR Advanced Targeting Pod (ATP). Also included is the ROVER or remotely operated video enhanced receiver to provide sensor data to personnel on the ground. Structural improvements will feature an all new wing for the 242 A-10s that were originally built with "thin skin" wings. 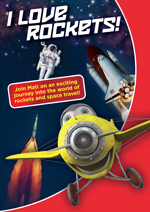 Long lead funding has also been provided for an improved higher thrust engine. On 2 April 2007 the Government Accounting Office estimated the potential total cost of upgrading, refurbishing, and service life extension plans for the A-10 force at up to $4.4 billion. The first unit to receive the A-10 Thunderbolt II was the 355th Tactical Training Wing, based at Davis-Monthan Air Force Base, Arizona in March 1976. The first unit to achieve full combat-readiness was the 354th Tactical Fighter Wing at Myrtle Beach AFB, South Carolina in 1978. Deployments of A-10As followed at bases both at home and abroad, including England AFB, Louisiana, Eielson AFB, Alaska, Osan Air Base, Korea, and RAF Bentwaters/RAF Woodbridge, England. 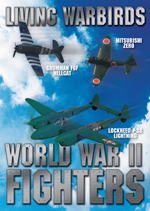 The 81st TFW of RAF Bentwaters/RAF Woodbridge operated rotating detachments of A-10s at four bases in Germany known as Forward Operating Locations (FOLs): Leipheim, Sembach Air Base, Nörvenich, and Ahlhorn. The A-10 saw combat for the first time during the Gulf War in 1991, destroying more than 900 Iraqi tanks, 2,000 military vehicles, and 1,200 artillery pieces. A-10s shot down two Iraqi helicopters with the GAU-8 gun. The first of these occurred on February 6, 1991 when Captain Robert Swain shot down an Iraqi helicopter over Kuwait marking the A-10's first air-air victory. Seven A-10s were shot down during the war. A-10s had a mission capable rate of 95.7%, flew 8,100 sorties, and launched 90% of the AGM-65 Maverick missiles fired in the conflict. In the 1990s many A-10s were shifted to the forward air control (FAC) role and redesignated OA-10. In the FAC role the A-10 is typically equipped with up to six pods of 2.75 inch (70 mm) Hydra rockets, usually with smoke or white phosphorus warheads used for target marking. OA-10s remain fully combat capable despite the redesignation. A-10s again saw service in the 1999 Kosovo War, in the later stages of the 2001 invasion of Afghanistan, in Operation Anaconda in Afghanistan in March 2002 and in the 2003 Iraq war. In Afghanistan the A-10 is based at Bagram. On 30 April 2003, USCENTAF issued Operation Iraqi Freedom: By the Numbers, a declassified report about the aerial campaign in the conflict. Sixty A-10s were deployed in Iraq; one was shot down near Baghdad International Airport by Iraqi fire late in the campaign. Of the A-10s deployed, 47 were Air National Guard aircraft, and 12 were from the Air Force Reserve. The A-10 had a mission capable rate of 85% in the war, and fired 311,597 rounds of 30 mm ammunition. The A-10 also flew 32 missions in which the aircraft dropped propaganda leaflets over Iraq. The A-10C first deployed to Iraq in the third quarter of 2007 with the 104th Expeditionary Fighter Squadron of the Maryland Air National Guard. The jets include the Precision Engagement Upgrade. The A-10C's digital avionics and communications systems have greatly reduced the time to acquire a close air support target and attack it. The A-10 is scheduled to stay in service with the USAF until 2028 and possibly later, when it may be replaced by the F-35 Lightning II. The entire A-10 fleet is currently undergoing upgrades. 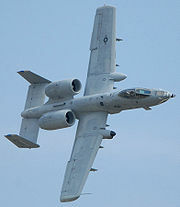 The A-10 could stay in service longer due to its low cost and its unique capabilities — such as its cannon, ruggedness, and flight endurance capabilities. Single-seat forward air control version. Two-seat experimental prototype, for work at night and in bad weather. Later redesignated YA-10B. Only one example was built, which is now on static display. A-10As updated under the incremental Precision Engagement (PE) program featuring a new glass cockpit (including digital moving map displays), advanced datalink, and all-weather multi-mission precision weapons and laser targeting capability. 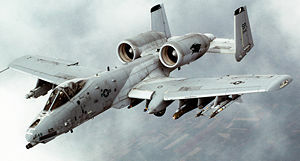 The A-10 Thunderbolt II received its popular nickname "Warthog" from the pilots and crews of the USAF attack squadrons who flew and maintained it. The A-10 is the last of Republic's jet attack aircraft to serve with the USAF. The Republic F-84 Thunderjet was nicknamed the "Hog", F-84F Thunderstreak nicknamed "Superhog", and the Republic F-105 Thunderchief tagged "Ultra Hog". A less common nickname is the "Tankbuster". The A-10 Thunderbolt is also referred to as: a 10 2 thunderbolt, a-10 thunderbolt 2, a10 thunderbolt, a-10 ii, a 10 jet, a 10 warthog pictures. This is the place if you are loking for: a-10 a, a 10 c, a 10 gun, a 10 video, a 10 gatling gun, a 10 pictures, a 10 jet, a 10 crash, youtube a-10, a 10 demo, a 10 videos, a-10 thunder, a-10 wiki, a 10 warthog gun.